I recently had the opportunity to work with the wonderful Fadairo from Wilhelmina Brown. I went into the studio fashion shoot knowing the effect and feel I wanted to use but still wasn't quiet sure about the lighting. I knew I wanted a dark and gloomy sort of feel to the whole thing. It would compliment the mystery that the smoke effect created and would fit well with the wardrobe we planned on using. As a photographer, I see a lot of photos every day. Whether it is from the various friends and groups on Facebook or websites like 500px. The one thing that I notice the most is the plague that is over lighting. Every video tutorial and workshop you go to seems to be about lighting. Well, it is an important part of photography, if not the most important. But it gets overdone way too much for this very reason. Always having lighting theory drilled into our heads puts us in this weird mode where we feel we have to use every single light at our disposal to create a photograph. And it ends up killing the contrast and mood and making the image very flat. 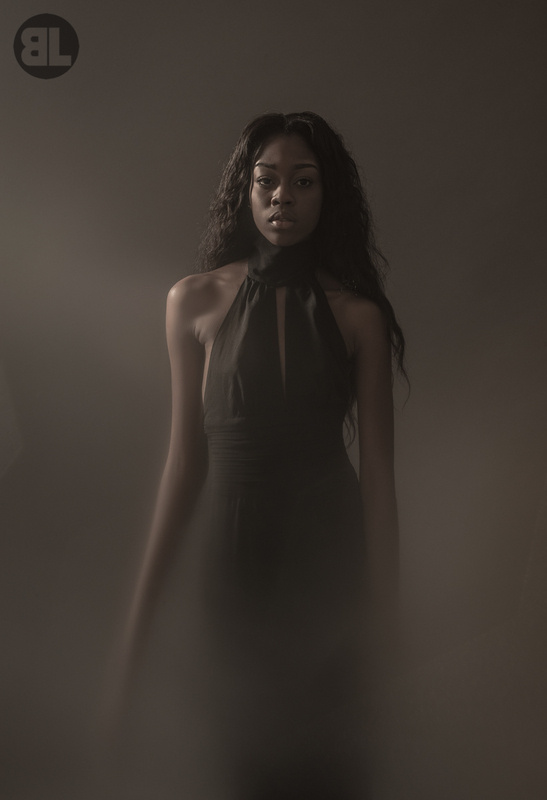 So as I started to set up my lighting, I spoke with Fadairo about what she was hoping to accomplish with these photographs and how she felt about mood and overall dark images. Finding out that she was on board with the whole idea, I pulled out my trusty beauty dish and 1 light. Placing the single light on a stand behind and camera left of Fadairo, I was able to ensure that the lighting would be very subtle and provide just the right amount of light I was looking for while maintaining the drama and mystery in the photographs. By placing the light behind my subject and feathered towards me, I was also able to control my lens flare creatively to enhance the shot further. So my recommendation next time you go into a shoot. Put away the 6 lights and start with one. Get it right and add another if you really need it, but don't be surprised if that single light will work just fine for you! I've been waiting to post this, due to publication. But they are finally released! The images made it into Giuseppina Magazine Issue 14!